Head over to Amazon where you can snag this 48-Count of Ocean Spray 100% White Grapefruit Juice 5.5oz drinks for just $13.13 shipped when you opt to Subscribe & Save. That’s just 27¢ per drink! Tropicana juice boxes are just 21¢ each here! Head over to Amazon where you can snag this Scotch Outdoor Mounting Tape in gray for just $3 – lowest price! This mounting tape is double-sided and is designed to hang items up to 5 pounds, such as address plaques, house numbers, and more. Get organized with these easy tips! Amazon is currently offering savings on select “summer essentials.” We might be headed into cooler weather but it’s still a great time to save $10 off $40 Men’s Grooming, Sun & Skin, Women’s Shave and Feminine Care Essentials. 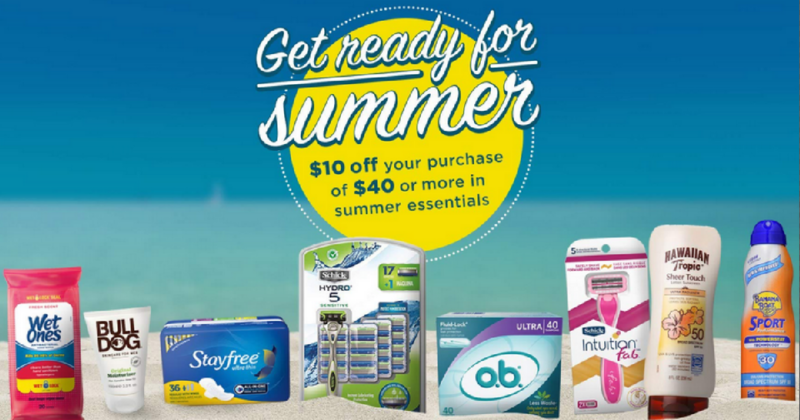 Save on Schick products, Stayfree, Playtex, Bullfrog and more. Add $40 of participating products to your cart to get your savings. Prices subject to change at anytime. Shipping is free over $25 with Amazon Prime. Head over to Amazon where you can score a FREE digital download of The Chase by Garth Brooks and Triple Live by Garth Brooks. Once you place the albums in your cart and place your order, the albums will be available for you to download! Enjoy hours of Garth Brooks as Triple Live includes 26 tracks and The Chase includes 10 tracks. Blast from the past! Pre-Order Your PlayStation Classic now! Hop on over to Amazon where they are offering up this 4-pack of Lysol Disinfecting Wipes in Lemon & Lime Blossom (320-count total) for just $8.98 shipped after you clip the 20% off coupon and opt to Subscribe & Save! I find that just doing a little cleaning each day keeps me from doing a ton of chores on my days off work! For example, I keep Lysol wipes in each bathroom so the counters and toilet can be wiped down every other day. – HIP’s Sidekick, Cassandra! Did you see these new Bath & Body Works sprays? Head on over to Amazon and clip a coupon for 30% off Amazing Grass Organic Wheat Grass & Trio Powder. Even better, some of these items are eligible to Subscribe & Save which means an additional 5% – 15% off and free shipping! Final cost $28.45 shipped – just 28¢ per serving! Final cost $11.64 shipped – just 38¢ per serving! Now through October 5th, Amazon is hosting a 30 Days of Savings Event and offering up different flash deals on select snacks and drinks each day. Even sweeter, select items are also eligible for Subscribe & Save which means you’ll save an additional 5%–15% and score free shipping! Today, September 19th only, head on over to Amazon where you’ll find awesome buys on snacks perfect if you’re hosting a “Talk Like a Pirate” party! Don’t forget the costumes! Final Cost $14.69 shipped – only $0.92 per package! Final Cost $16.09 shipped – only $1 per package! Final Cost $18.19 shipped – only $1.14 per package! Final Cost $9.74 shipped – only $2.44 per box! Today, September 19th only, hop on over to Amazon where they are offering some nice buys on Rainbow Daze Kids & Toddler Rain Boots and there are lots of cute options to choose from! These rain boots feature easy-on handles and are great for kids ages 2-9!